I studied psychology in high school and college, and still find it imminently relevant today. I am fascinated when evolutionary psychology can offer insight into the roots of why we tick the way we do. What is our more original “programming” — or the baseline that we are set to be impressed into by the environment? What are our ancient drives, needs, functions, and wiring? Not to indulge it all, but to at least understand it, to accept it, and to work with it. To decipher enough of the user manual behind the human mind that we can better work with its inputs and outputs. Looking at it this way, we are crafted through nature to be a deeply social species. We only survived by relying on and taking care of each other. 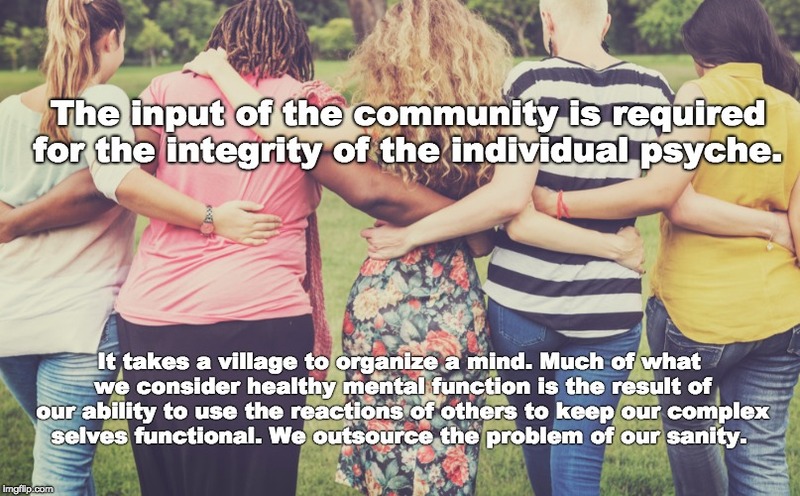 Maybe many of our mental illnesses and spiritual or existential malaises today have come in part from us being separated by our connection to community. Isolation, and relating to people primarily in surface ways, can cripple our emotions, our immune system, our sense of well-being and self-respect, and even our sanity. Maybe we should treat our community as a very part of ourselves again. As if more than our happiness — our survival and sanity — depends on it. Being a human is a wild experience, which can feel odd, pointless, or difficult at times. Being close to people who mutually care about each other, we can support and share in this strange reality together!